Well hello there beautiful people. Do mind that I relize that I have not blog for a very long time. Things around goes on and on. I wish I can just freeze the time. Phew. I felt so bad on leaving my blog like this. There are tons of product I need to share and review to you guys and let me try to blog about it as much as I could. Today I am going to review a brow kit that I tried a few months ago and it is the Makeup Revolution Focus & Fix Eyebrow Shaping Kit in Light Medium. I lovee brow products and trying our new brow stuff. I also have been diving into a non-pencil type brow products lately just to experiment with different stuff. This Makeup Revolution Focus & Fix Eyebrow Shaping Kit comes with a tweezer (to pluck your eyebrow if needed), a small angled brush (to fill in and shape your brows), 3 powders (2 light colors to highlight I believe), 1 medium color (to fill in your brows) and a wax to keep your brow hair in place/shape it right. What I like about it. I love how this comes in a kit with a brush and a tweezer. The brush is pretty convenient especially when I forgot to bring my brow brush around. I really love the wax. It works so well on taming my brow hair and keeping it in place. Price wise, a borw kit that only cost not more than RM20.00. How cool is that. What I don't like about it. A few hours of wearing the color fades. The powder is a bit "blurry" to me and its really hard to make a sharp edge with it. Also I don't really use the other 2 light colors in this kit, I don't think its needed in this kit. It does not really have a brightening effect to be put under my brow bone. Overall & Recommendations. A great brow kit for you beginners out there who are looking for a brow kit with a wax. Since wax/brow gel (to set brow) for brow is really hard to find in the market. Especially if you have thick brow hair. A wax is a must to keep everything in place. The kit also stores 2 tools that is very useful to bring along. The brow powder is okay to me. I am much loving the wax out of all the powder in this kit. i started filling my brows on my 20s. remembering the old days masa tak kisah pasal brow ya Allah kelakar rupanya! haha, framing the brows really make a huge difference. kalau xmakeup, tp kemas kan kening pun dah boleh buat muka nampak fresh. I can see that the brows are filled in quite nicely. :D (kalau kita gamaknya terlebih2 kot) hehe..
but seriously, nicely made brows make you look polished. do come into my blog: mommylotte.com ya! Mira terus falling in love with Makeup Revolution ni. Price dia murah and product dia berkualiti. 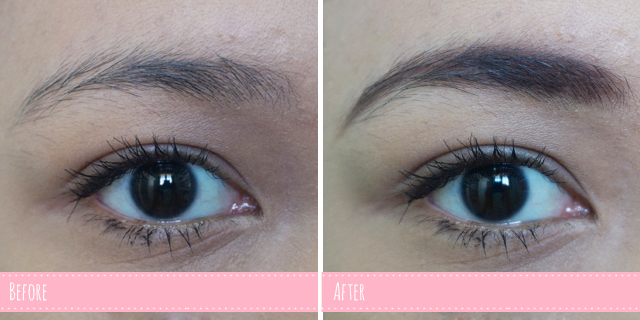 I just use eyebrow pencil from Silkygirl.haha I think it's enough for me but anyway, wanna try this someday. Lagi satu Sab, bulu mata you cantik la. silkygirl brow pencil was one of the first product i use! thank you dear!